Back in late May, Sheri Sorvillo—a great friend of mine and Tara’s—asked if we would send her signed copies of her books, a request we were happy to oblige! I autographed a copy of On the Road with Del & Louise, my wife signed her new book Bystanders, and then Tara packaged them up, bubble wrap and everything, and sent them on their way to Florida, where Sheri now lives. When Tara texted, “Did a bear get it? 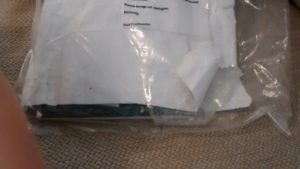 It was wrapped in bubble wrap,” Sheri replied with photos showing just the slightest fraying at one corner of the cover. But when I texted, “How’d mine pull through? 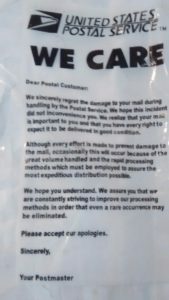 Did no one at the post office want to read it? ;-)” Sheri’s good mood turned troubled. As I said, it had been—of course. Because we hadn’t bought insurance, the lost copy wouldn’t be covered by the postal service (more on that in a second), so I simply promised to send Sheri a replacement copy. Sheri, in turn, insisted on paying for both copies (the lost one and the replacement one). I insisted that the loss wasn’t her responsibility; she insisted it wasn’t mine either. 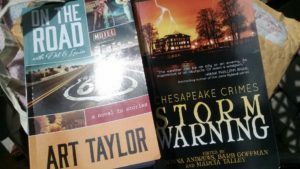 And somewhere in between texts and checks, I ended up sending her not only another copy of Del & Louise but also a copy of the new Chesapeake Crimes anthology too. As before, I signed, packaged (in a padded envelope), and mailed. At the counter, I thought about adding insurance to the package, but then told myself Nah, what are the chances of lightning striking twice in the same place? 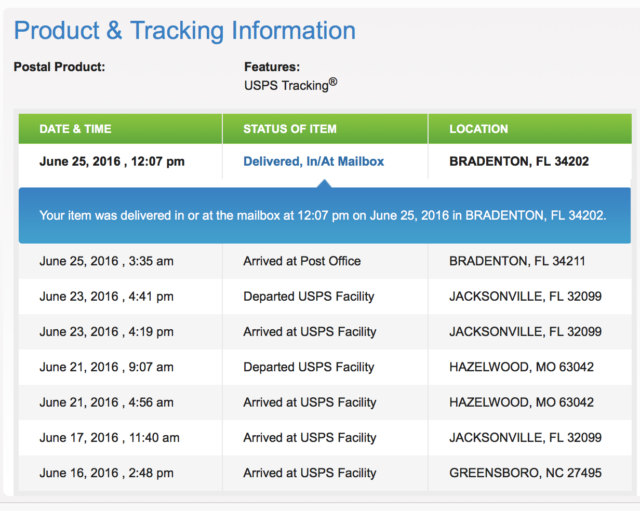 And then I started watching the tracking page (see the image above) as the package headed down to Florida—and then took an abrupt turn to the Midwest, to Hazelton, Missouri, a sort facility which had been called “the Black Hole” of the postal system in one online conversation I discovered. I could go through the many thoughts that careened through my mind: frustration at the postal service, frustration with myself for not buying insurance, concern about how much all this was costing all of us, anxiety about each new update on the tracking page, anticipation of the customer service I’d receive when I called to complain… right on down the line, even when the tracking page said the package had returned to Florida and then departed again soon after—for destinations unknown. Back to Hazelton again? Fortunately, the package finally arrived safely—and Sheri’s photos of the books on her end were a big relief on this one. Here’s hoping that next mailings don’t decide to take any similar detours as well!